OK, I am the first to admit that this recipe sounds too gourmet to be easy. But frittatas are one of the easiest brunch foods to whip up- I cooked this one in five minutes flat- and the variety of ingredient combinations you can use will make you look like quite the sophisticated epicurean: see below for more different variations on this dish. I've cut the directions down to five easy steps! 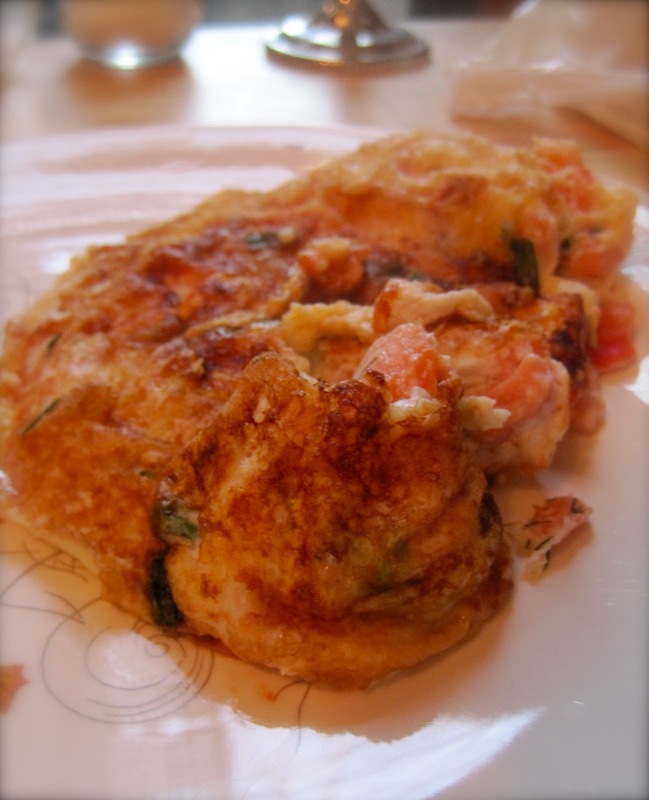 I use liquid egg whites to make my frittatas/omelets (just to clarify, I make the two interchangeably: technically, a frittata is broiled to finish, while an omelet is folded over the filling in the middle.) This eliminates the high amount of cholesterol in the yoke, and the protein fills me up despite the low calorie content- 1/4 cup of egg-whites has 30 calories. I also use fat-free cottage cheese in this recipe to maintain the creamy cheese taste that pairs beautifully with smoked salmon, but again limits the bad fats, cholesterol and cals. Finally, make sure to use cage-free eggs: the simplest way to ensure that the hen responsible for your breakfast lived a humane lifestyle. 1. Spray medium-sized nonstick skillet with cooking spray over medium heat. 2. Add scallions and tomato, cook covered for 2-3 minutes. 3. Pour in egg-whites, and quickly add in smoked salmon and cottage cheese. distribute evenly throughout the liquid egg-whites. 4. Cook covered for 3 minutes. If the center remains runny, lift edges with a spatula to let uncooked egg run underneath. 5. Sprinkle dill on top. Move frittata to oven and broil until frittata is puffy and golden for 1 minute, OR fold over and cook covered for 2 more minutes if you want an omelet. Doesn't it make you feel better knowing that the chickens that produced the eggs in your delicious meal lived a humane life...aka, they got to move? Believe it or not, most eggs are not cage-free: in other words, the average hen who produced them lived its life in a 67 square inch battery cage. That is smaller than a letter-sized sheet of paper. This chicken would never even have the chance to spread its wings. In contrast, cage-free eggs allow chickens to walk around and embrace natural behaviors like laying eggs in nests, perching, and dust-bathing (how birds clean their feathers to remain parasite-free). Most cage-free hens reside on farms with 3rd-party certification programs to ensure a more humane way of life. "Cage-Free vs. Battery-Cage Eggs: Comparison of Animal Welfare in Both Methods." The Humane Society of the United States. Web. 6 Feb. 2011. <http://www.humanesociety.org/issues/confinement_farm/facts/cage-free_vs_battery-cage.html>.